I consider problem solving training essential career preparation for the elementary student with cerebral palsy (CP) you're mentoring as a parent, relative, friend or neighbor. Let me give you some examples of my own problem solving training. It was 1979, and the women’s movement had not yet reached rural Wisconsin. As corporate communication director for a cheese manufacturing firm, I had just hired Heather to lead our corporate marketing program. She was the first woman in our entire company to hold a job beyond the clerical level. Since I had CP and, as a result, walked and talked with difficulty, I soon learned that I could delegate some of the “spokesperson” duties of my department to Heather because she came across crisp and confident in front of a group. But, Heather and I soon found being crisp and confident in front of a group didn’t always work well – especially if the group consisted of men and those men happened to be milk truck haulers who had probably tossed hundred-pound cans of milk in and out of their trucks since high school. At one of our series of hauler meetings, Heather actually lost her focus for a moment during her presentation about our upcoming advertising campaign because several haulers started talking to one another in the audience, ignoring what she was saying. Both frustrated, we sat down the next day to figure out what had gone wrong. I could see Heather was ready to quit and move on to another job. I needed her skills. So, I decided to level with her. Remember, this was rural Wisconsin in 1979. From then on, we kept an evolving list of directive “hot button” words and phrases between us and tried to come up with viable alternatives – words such as “we can get this done by…” instead of “you need to…,” for example. And, between us, we deliberately practiced each subsequent presentation with those “hot button” words in mind. Heather stuck with me for eight more years, largely because I believe we helped each other grow in our jobs. As a “graduate” of the women’s movement rural-Wisconsin style, she now owns and manages her own advertising agency in a major U.S. city. 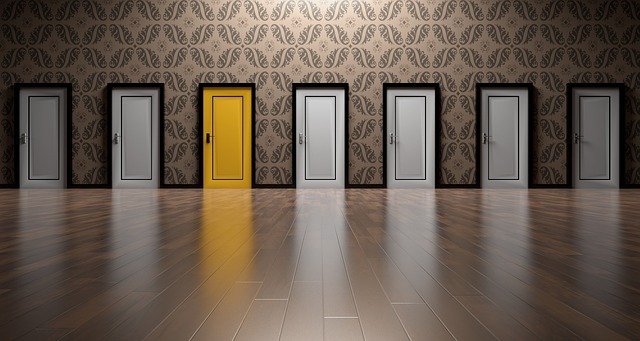 Problem-solving training for your youngster with a disability: Choosing the right door. In 1979, I didn’t realize where I got the idea of deliberate practice to avoid those “hot button” words, but now, more than three decades later, I know. The concept came from my physical therapist 26 years earlier when I was 10 years old. In 1953, I was attending an orthopedic grade school which provided physical therapy (PT) each afternoon. At 2:00 each day, I would go to the PT room to practice my gait, stretch my heel cords and methodically go through exercises to improve my balance under Ms. Browning, a stern taskmaster who didn’t mince words as she pointed out each day what I needed to improve. She took me outside, and I watched her methodically lay down a tape measure from curb to curb, temporarily stopping traffic on each side of her. Step by step. Within six months, I could confidently cross the street – a pattern I would also use 26 years later, word by word, in coaching Heather in her presentations. Employees who have learned how to live well with their disabilities through the help of previous mentors are often in a good position to also help others on a work team team to effectively address their personal challenges. Their previous experience in dealing with vulnerability may give them an extra measure of empathy. They may know how to stick to an often boring routine of deliberate practice. And they may have experienced the feeling of achievement through deliberate practice. As a result, they may be in a good position to help hiring managers retain talented individuals who might otherwise decide to quit their jobs and switch to competitors in search of mentors who both challenge and encourage them as they face the next hurdle in their career development.